Goodreads description--From the author of the twenty million plus copy bestselling novel The Shack and the New York Times bestsellers Cross Roads and Eve comes a compelling, conversational exploration of the wrong-headed ideas we sometimes have and share about God. Wm. Paul Young has been called a heretic for the ways he vividly portrays God’s love through his novels. Here he shares thirty-three commonly uttered and sometimes seemingly innocuous things we say about God. Paul exposes these as lies that keep us from having a full, loving relationship with our Creator. I didn't love The Shack by William Paul Young. I liked that it challenged me to think more deeply, but I fundamentally disagreed with a lot of the theological aspects about God as described by it. Truly the only way I made it through reading The Shack was to remind myself that it was a work of fiction. I wish I'd re-read my review of The Shack before deciding to request Lies We Believe About God, but I didn't. What I did was remember that while I didn't agree with everything William Paul Young said...it did cause me to think. And since I've been overwhelmed with a feeling of how much and how often so many people believe things about God that just flat aren't true, I was intrigued by this book. I was hoping that it would be a great reference to be able to refer people to when they misunderstand God's nature. Yet again...I was WRONG. Instead what I found was that William Paul Young himself believes quite a few lies about God. You guys...there was SO SO SO much wrong with this book. I truly wish I could break down every single lie within this book...every single misrepresentation and present you with a rebuttal. I wish that I could, but it isn't the purpose of my blog to do so. My purpose is to review the book and what I thought about it. So I'll do my best to do so. If you choose to believe in God there has to be a standard or a place where you receive your information about Him. You can't just make it up...although many people have. So...where do you go? Where do you find the information needed to find out who God is and what His character is like? HIS WORD. He has revealed Himself to us through His Word--The Bible. God revealed Himself and divinely inspired over 40 different authors from all manners of vocations over a period of 1500ish years using 3 different languages. For this book to be cohesive and non-contradictory is impossible without Him. Yet it is because of Him. So what I expected to find when reading Lies We Believe About God was a bunch of Scripture to back up these "lies". Instead what I found was William Paul Young quoting his own works of fiction. There are 32 references to/quotes from The Shack in Lies We Believe About God. This is not including any references to William Paul Young's other books (Eve and Cross Roads). In a 272 page book, that's roughly every 8.5 pages that he references his own book, his own thoughts as a source of information about who God is. In comparison there were roughly 14 references to New Testament Scripture within the main chapters of this book. That's roughly every 19.5 pages. So William Paul Young references his own books more than 2 times the frequency of Biblical text. (Granted, I didn't search for Old Testament Scripture references, but I also didn't cite his references to his other two books either.) He does have a chapter at the end of book that has an additional 33 references from The Bible. This means that overall the Bible is only used within Lies We Believe About God 15 more times than his own books. You guys...this is unacceptable. If you want to learn about God, you don't go to a human's work of fiction. That's no better than making things up yourself. You go to the Source. God's own Word about Himself. There were many times when I felt like William Paul Young was arguing over semantics. Yes, I'm a firm believer that our words mean something and it is important to choose to right words in our conversation and speech so that we convey the message we mean to convey. Let's take one chapter titled "God is disappointed in me." He argues that there is a difference between disappointment and grief. "Disappointment largely revolves around expectations and imagination. I expect you to act a certain way, or I expect a specific outcome..." "This is precisely why God is never disappointed in you. God has no such imaginations or illusions. God knows you, completely, fully, and with unrelenting affection. You don't surprise God. God delights in you, as you delight in your own children; God also grieves for and with you when you act inside your lies and darkness--but not because God expected more of you." This is semantics. Whether we "disappoint" or "grieve" God because of our behavior, the outcome is the same. He is not pleased. Yes, He can and does still love us despite our actions, but William Paul Young is giving off the impression that it doesn't matter what you do...how you act...and I don't see how anyone who has read the Bible can come to that conclusion. In fact, if you've read the Bible, you don't get 3 chapters in (on page 3 in my own personal Bible) before man's actions make a huge impact and "grieve" God. Semantics. And this isn't the only time this happens. It happens frequently throughout this book. In connection with my point about William Paul Young quoting and referencing himself and his own published books more frequently throughout the main body of Lies We Believe About God, I felt often times that he was just "making things up because they sounded good." There were often times when his thoughts were poetic. And that's hard because I believe that God is a poet. His Word is beautiful. His thoughts are beautiful. The magnitude of His knowledge and planning and working is beautiful. He is so multi-layered. Everything about Him from the way that He thinks and acts to His very character. He can be 100% Love while also being 100% Justice at the same time. And so there were times when the poetry of what William Paul Young suggested about God sounded good to my human ear, but when bounced against the Scripture it just didn't add up. I don't claim to know all there is to know about God. I don't claim to be perfect or to have a perfect understanding of Him, but having read The Bible cover to cover each year for the last 5 years and I'm working on my 6th straight read-through I feel pretty confident in being able to spot false teaching about God like this. I don't want to judge his person...his heart. That's not my job or my duty or my desire. God is the judge. However, I felt like pride and arrogance were pouring from the pages of this book. Nearly every chapter felt full of both. I even read his acknowledgements where he says "I am surrounded by people who love me, but aren't impressed. Thank you!" Even though this was an attempt to appear humble, it didn't read so to me. It read falsely. Or at the very least "thank you all for not being impressed by me because I'm so impressed with myself." It's funny because I told Husband that this felt so starkly contrasted against Shaken by Tim Tebow where humility truly poured off every page. I felt like Tim Tebow is a truly humble person from his book and where he might struggle with pride, the effort to crush it was palpable. And this is not the same vibe that I got from William Paul Young. I mentioned earlier the chapter at the end of Lies We Believe About God. He titles it "A Catena" which means "a connected series or chain". And ironically, because I've read The Bible from cover to cover it felt so obvious to me that these verses used to convey a specific message were pulled so completely out of context. You can use Scripture to prove just about any point sadly. The Bible even says "There is no God" (Psalm 14:1). But that's pulled out of context because the verse says "The fool says in his heart, 'There is no God.'" I think we've all witnessed how words and phrases taken out of context can give a completely unintended and false meaning. Watch any court TV show where a witness's words are twisted by a stealthy lawyer. You'll see it happen. I told Husband that reading those series of verses, Words from God's mouth, strung together out of context made my stomach hurt. Seeing God's Word twisted to mean something that it doesn't...it made those words ugly. And the sad part is that someone who might not know better could be misled by them. Context is so important. I myself have used a verse here and there to prove a point, and I don't know that doing so is wrong if you're not using those verses to make a point outside of what Scripture as a whole harmonizes to say. Yet the person unfamiliar with the Bible and what the context should be would never know. This is why reading it (the Bible) for yourself is so important. It is crucial. Not just taking the word of a preacher or family member. Definitely not taking the opinion of an unbeliever who might have "thoughts" about God and who He is and how He thinks. And not even taking the word of someone who appears to know much about God. You have to search and read the Bible for yourself. 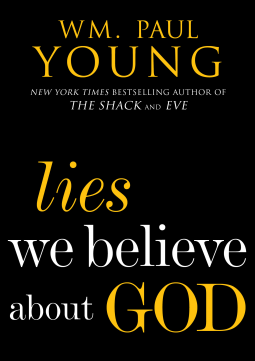 I feel certain that there was much more that I wanted to say about William Paul Young and Lies We Believe About God, but what it truly boils down to is "this man does not know God." Don't read this book to learn about God. Read The Bible. William Paul Young references his own (FICTION) books more frequently throughout the meat of Lies We Believe About God than he does any other source--especially The Bible. This is not the book, nor the man, to go to if you want to know God. And I personally won't be reading any more of his work myself. Lies We Believe About God gets 1 Star. Have you read Lies We Believe About God? What did you think? Let me know! This review was first published on Somewhere Only We Know.